The special counsel’s report is out, but it really hasn’t changed the basic facts in our case to get Donald Trump out of office. He’s implemented policies that have hurt millions of Americans, strained our economy, and run one of the most corrupt administrations in history—and we don’t need a report or court to prove that. It’s obvious. Sen. Amy Klobuchar is one. From 1999 to 2007, she served two terms as Hennepin County Attorney. Hennepin County includes Minneapolis, making it Minnesota’s most populous county. During that time, she helped pass Minnesota’s first felony DWI law, a top priority for Minnesota’s mom-led activist groups. In fact, motherhood is what catapulted Sen. Klobuchar into politics. After her own experience as a new mom, she became an advocate for requiring hospitals to ensure mothers a 48-hour hospital stay. That policy became law in Minnesota and federally thanks to her leadership. She didn’t know it then, but that dip into local politics would set the stage for her to make history: In 2006, she became the first woman elected to the US Senate from Minnesota. Now, Sen. Klobuchar is vying to make history again by shattering the highest, hardest glass ceiling in American politics. The first quarterly fundraising deadline of the 2020 cycle is March 31, and we need to show momentum and enthusiasm for electing a woman president. They all need to be funded and competitive as we look toward the first debates in June. 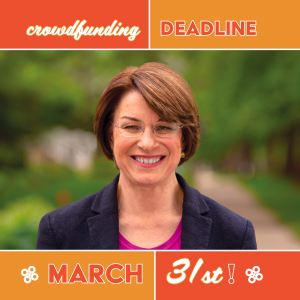 Give $20 to Sen. Klobuchar and the three other women on our Get Them on the Stage slate, and help us hit $10,000 raised for them by March 31.